Despite the fact that the the Chicago Board of Education�s vote on Noble Network�s proposed charter high school at 5357 W. Grand doesn�t take place until Jan. 22, construction has begun on the new high school, across the street from Prosser High School. Roosevelt sophomore Jamie Adams and Prosser freshman Lisette Lopez protest the Board's push for charter schools while their schools face severe budget cuts.Students and parents spoke out against the Board of Education hypocrisy at a press conference on Jan. 21, the Martin Luther King, Jr. holiday. The protest was held three days before the January 22 meeting of the Chicago Board of Education. The agenda for the Board meeting, which was made public under the Open Meetings Act on Friday, January 17, includes 21 agenda items which will expand the city's more than 100 charter schools. Roosevelt High School sophomore Jamie Lee Adams opened the press conference noting the �done deal� of the Board�s vote. Communities United for Quality Education (CUQE) and Chicago Students Organizing to Save Our Schools (CSOSOS) organized the press conference. 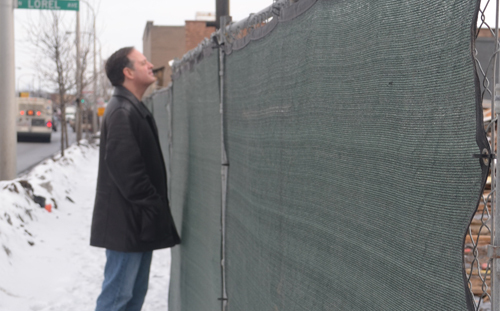 A Noble Network employee who refused to give his name to Substance, checking out the demolition on Jan. 20.Just prior to the 2:00 p.m. press conference, a Noble St. official, who refused to give his name to Substance, took pictures of the demolition trucks clearing debris at the site, and insisted �there is nothing exciting going on.� Noble is building a high school, not only across the street from an existing high school, but also within 1.5 miles of five other high schools, none of which is overcrowded. Other charter proposals that the Board will vote on on Jan. 22 are not needed to relieve overcrowding. 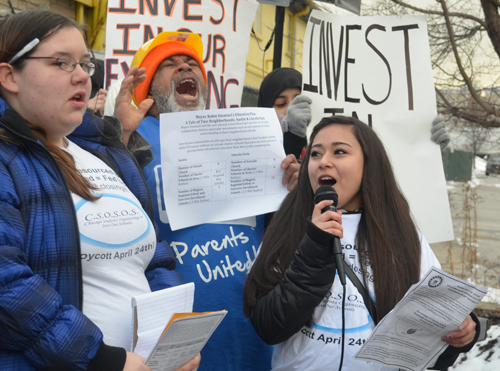 CUQE and CSOSOS shared data in their press release showing that 90 percent of the proposed new charters, including the proposed Noble high school, �are not located in communities that CPS has prioritized for overcrowding relief.� According to the CUQE/ CSOSOS press release, �Twenty out of 22 of the proposals have either failed to secure a permanent location or are located in communities that CPS has not identified as overcrowded in their initial request for proposals.� The vote by the Chicago Board of Education to approve the Noble school to be built across the street from Prosser High School (a site already being cleared by demolition crews) doesn't take place on Jan. 22.Everyone at the Jan. 20 press conference said new charter schools are not needed and that existing schools should be fully funded. Prosser freshman Lisette Lopez said it wasn�t fair that a new school was being built when other schools lacked basic resources. �My school is a great school, and it could be even better,� she said. �I attend a Chicago public school and I am a youth leader of Action Now. Today we have come forward to express our concerns for opening 22 more charter schools across the city. Charter schools that will cost our collective communities $250 million that could be used to bring more opportunities into the public schools. �I know that students do in fact want more for themselves and they want to do better. However, so many schools are not being given the necessities to get results that actually reflect the intelligence that public school students have. "Shame on CPS. Shame, shame on CPS," said Zerlina Smith, because it closed 50 schools yet will open new, unnecessary charter schools. 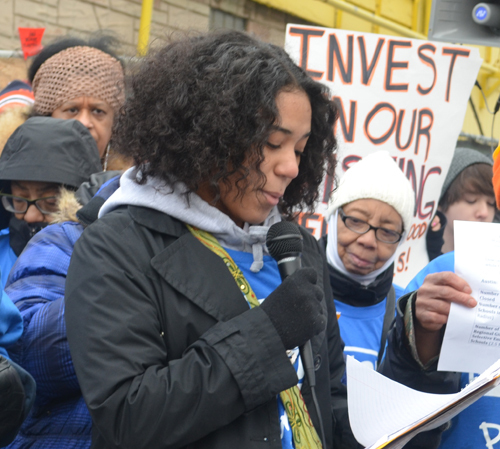 Zerlina Smith, an Action Now member, parent of a CPS student, and member of the Maria Saucedo Elementary School LSC, shamed CPS: �We are here today on Martin Luther King Jr. holiday. In 1965, King responded to a request from local civil rights forces in Chicago. King and the SCLC joined the fight against school superintendent Benjamin Willis and Chicago�s segregated public schools to launch a campaign to end slums in the city, which would be known as the Chicago Freedom Movement. 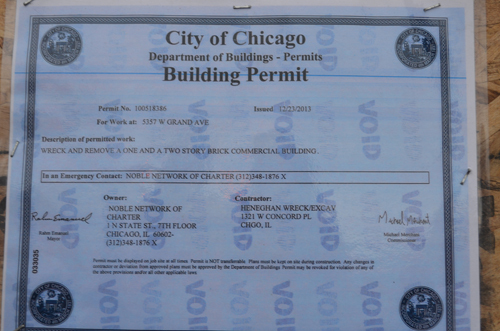 With the Noble St. charter building permit tacked up behind them, students and parents protest the Noble St. and other CPS charter school expansion on Jan. 20. The vote by the Chicago Board of Education to approve the Noble school to be built across the street from Prosser High School (a site already being cleared by demolition crews) will take place on Jan. 22. �We the parents and the real community leaders are going back to the King movement. 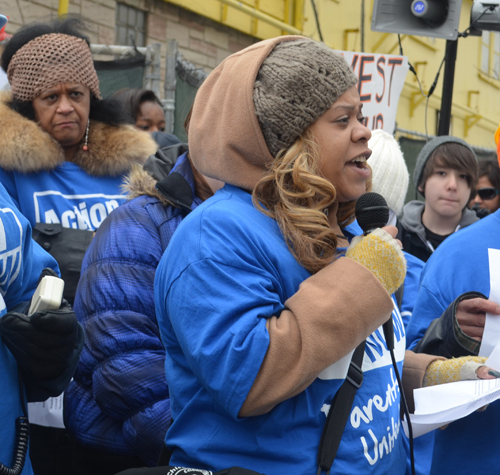 We will organize the people, marching and protesting the mayor and his appointed Chicago Board of Education to vote �No� on all charter school expansion proposals on Jan. 22. �We the people don�t need predatory educational institutes for our children in our communities. Charter schools don�t have to answer to no one; they do as they please with our kids. Charters schools are political and business run programs just to make money on the heads of the children and tax payers. �If charter schools are so great, why are they only interested in coming to high poverty areas. This year, CPS closed 50 schools and slashed the budgets of the remaining CPS schools throughout the city. Now CPS has the money to finance and build new schools? Shame, shame on CPS. This is the time for us to remind the people of the 1965 Chicago Freedom Movement,I'm ready to show The Mayor and His Board Members how Radical Looks in 2014 for our Children.Taking Back Our Neighborhood Schools really benefit our children,teachers and the taxpayers.